Why train your staff members in First Aid? Accidents are the number one cause of illness and death in children aged 1-18. Over 340,000 children are injured in accidents every year in Switzerland. Most children spend up to 60% of their weekday waking hours at school so a significant proportion of these accidents happen at school. Good, prompt First Aid delivered by a calm, trained person can significantly reduce the impact of any injury. Our First Aid for Schools training is aimed at all members of staff who have contact with students. Each participant will learn how to manage important First Aid situations that may arise during the school day. Asthma attacks and allergic reactions, including how to use an Epipen. Plus, what to have in your School First Aid Kit and how to manage the use of medication in schools. Course certification: HealthFirst Certificate of Attendance in CPR & Basic First Aid for Schools (valid for 2 years). Learn what an AED is and its action on the heart. 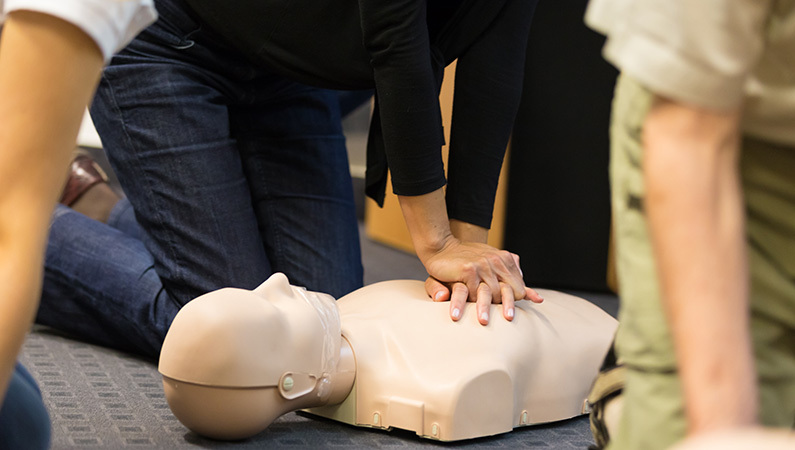 Understand how AEDs save lives in the community. Know where to find an AED and who can use one. Practice using an AED safely during realistic scenarios.